Imagine this: A spending opportunity arises (your friend’s destination wedding, a non-functioning car or computer, a conference, a tax bill) and as much as you scrimp that month and the next you just can’t cover the expense with cash. I ran into this problem during graduate school and found a workable solution: targeted savings accounts (or sinking funds). 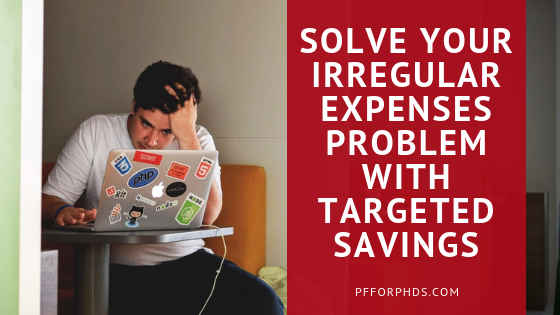 When I present this solution during my personal finance seminars, I find that it really excites the PhD students and postdocs in the audience because large irregular expenses are such a common problem with this population. Irregular expenses are expenses that occur infrequently. Typically their frequency is once per year or a few times per year; they definitely do not occur every budgeting period (month). When you have a small irregular expense that can be easily absorbed by your ‘Miscellaneous’ budget line item or within the normal fluctuations of your monthly spending, they don’t pose a problem. The irregular expenses that call for a solution are large ones that your typical monthly cash flow cannot absorb in stride. For example, if you have a Miscellaneous line item in your budget of $25 and could find another $25 of wiggle room by cutting back if necessary, one irregular expense of up to $50 in a month does not on its own call for an involved solution. However, if you had an irregular expense of $500, how could you pay for it without wrecking your budget? Why Are Irregular Expenses a Problem for PhDs? Paying for irregular expenses becomes an issue for anyone with low discretionary cash flow; that is, anyone whose necessary expenses closely approach their total available income. Due to their limited incomes, graduate students and postdocs often have low discretionary cash flow, especially when their pay is not sufficiently indexed to the local cost of living. That PhD trainees are strapped for cash is not news to anyone, but the irregular expense problem is exacerbated for graduate students due to the academic calendar. There’s no rule that only one irregular expense is allowed to occur each month to permit maximum cash flow absorption. When it rains, it pours. Irregular expenses due to your university tend to cluster at the start of the academic year or perhaps the start of each term. For example, at the start of the academic year you might owe to your university lump sum payments for some tuition and/or fees, part or all of your health insurance premium, and your parking permit. Graduate students and postdocs receiving fellowship stipends/salaries typically have an additional irregular expense: quarterly estimated tax payments. Instead of having income tax withheld from their paychecks, they receive their full gross income as their take-home pay and are expected to make quarterly estimated tax payments (or pay once per year in some cases). These payments are due four times per year, though not on the regular schedule of once every three months. There are several ways to handle irregular expenses: putting them on a credit card to pay off over time, cutting back in other areas of your spending to accommodate them, forgoing them, and saving for them in advance. Of those options, saving in advance is the most financially sound. Planning and saving ahead allows you to balance the irregular expenses with your regular expenditures and avoids paying interest. For some people, setting aside an amount of money every month for whatever irregular expenses may arise could work, but again probably best for people with larger amounts of discretionary cash flow. For those on tighter budgets, like many PhDs in training, to plan ahead and optimize your use of money, you probably need a more specific plan. This is where targeted savings account come into play. The use of targeted savings accounts is essentially a method of detailed budgeting that extends to the year rather than just the month (or whatever shorter budgeting period you use). A year is a good amount of time over which to try to predict the irregular expenses in your life. A targeted savings account is: 1) a savings account (or, alternatively, a designated fraction of a larger general savings account) and 2) targeted for one particular irregular expense or category of irregular expenses. Every month, you automatically transfer a set amount of money from your checking account to your targeted savings account. Then, in the month when an irregular expense hits, you transfer the amount of money it cost back to your checking account to cover it. You determine the saving rate you need into your targeted savings account by projecting the expenses you expect to occur in that category in the coming year and then dividing the total by 12 (or fewer months if the expense is closely upcoming). For example, if you typically spend $600 on clothing, shoes, and accessories over the course of a year, your savings rate will be $50/month into an account dedicate for that purpose. All you need to do on the spending side is to not overbuy the available balance in your account in any given month. A targeted savings account lends itself well to this type of expense only if your shopping occurs less frequently than monthly and you spend a large (for your budget) amount of money each time, e.g., you shop once per year or seasonally. The tricky thing to get right with targeted savings accounts is to accurately project all the expenses that qualify as problematic irregular expenses in your life. You need to figure out the expense, the amount, and the timing so you can categorize the expense and calculate the savings rate. However, the savings that is transferred into your targeted savings account is not created out of thin air. If you were struggling with paying for irregular expenses prior to implementing this system, that struggle is not going to be immediately alleviated. Delineating your irregular expenses in this way helps with planning and budgeting, but it isn’t magic. It simply enables you to predict your expenses well and decide whether to allocate money to them (in advance) or your other priorities. This helps you more optimally use your money because you can give your plan forethought instead of making reactionary decisions following an irregular expense occurrence. But because it doesn’t create money out of thin air, you still have to make sacrifices in your spending to get the budget to balance. When you first implement targeted savings accounts, you have a choice between an immediate or gradual (likely over a year) implementation. However, in either case you are going to have to cut your regular spending a little deeper than is typical to find some extra cash in the first few months. The gradual approach to targeted savings is to set up and fund your various accounts over a year as the irregular expenses pop up. If in your first month an irregular expense arises, pay for it fully out of cash flow as you would have done previously. Then, determine how frequently and in what amount that expense will recur and calculate an appropriate savings rate to fully fund it over the course of the next year. For example, it is common to pay car insurance premiums once every six months. When that expense arises, you would pay for the insurance from cash flow, and then in the subsequent six months save one-sixth of the cost of the insurance each month into a dedicated account (“Cars,” “Insurance,” or “Car Insurance,” depending on what you want to combine it with). The next time you need to pay car insurance, pull the money from the targeted savings account, and then continue with your savings plan. If you follow this method for every problematic irregular expense throughout the year, by the end of the year you’ll have a fully funded and functioning set of targeted savings accounts. The challenge with this method is to keep fully paying for irregular expenses in their first occurrence throughout the year when more and more of your cash flow has been redirected to targeted savings accounts for future irregular expenses. Until you build up the entire year’s targeted savings, you’ll be making deeper cuts to your regular spending. But the gradual method allows you to find those ways to cut back slowly over time. To get your targeted savings plan in place right away, you have to do much more up-front thinking. Instead of waiting for irregular expenses to pop up over the course of a year as in the slow method, in the fast method you attempt to predict all of them for the year up front. Using tracked spending data from the previous year is very helpful in this stage, so if you are new to tracking spending or new to your city the fast method may not be a good fit. For each expense, you need to predict as best as possible when and in what amount(s) it will occur. If it’s a discretionary expense with no fixed timing (e.g., clothes shopping), you can simply use the amount of spending you expect to do over the course of a year. To calculate your savings rates with the fast method, you must take into account that you don’t have a year to save up what you need to in each category, so some of your savings rates might be quite high to fully fund an expense that is not too far in the future. For example, for Travel, you may have a pattern of traveling at certain times of the year such as holidays, school breaks, or over the summer. You may need to save at a higher rate to fully fund one of those trips if it is only a few months away. The rate will be able to drop some once the proximal event has been paid for. Because you have to front-load so much of your savings, using this method requires you to have the ability and willingness to make deep cuts to your spending in the first month you implement it. Targeted savings accounts are at base a way of extrapolating your budgeting over a year instead of just a month to account for your irregular expenses. By turning large, irregular expenses into small, fixed expenses, you can easily write them into your budget and weigh them against your regular monthly expenses. Often, a monthly expense will become less appealing with directly compared with a contribution to an irregular expense, e.g., you become motivated to limit yourself to one drink per outing because you can see the money going to savings for a concert. Early-career PhDs will do well to adopt a system of targeted savings accounts as irregular expenses are a common and difficult problem. Such helpful advice, Emily! I needed this during graduate school with the dozens of weddings. Now I plan for irregular expenses. Thank you!